Harness the power of 'quanteda', 'data.table' & 'stringi' to quickly generate 'tm' DocumentTermMatrix and TermDocumentMatrix data structures. gofastr is designed to do one thing really well...make a DocumentTermMatrix. It harnesses the power quanteda (which in turn wraps data.table, stringi, & Matrix) to quickly generate tm DocumentTermMatrix and TermDocumentMatrix data structures. There are two ways in which time is meaingingful to an analyst: (a) coding time, or the time spent writing code and (b) computational run time, or the time the computer takes to run the code. Ideally, we want to minimize both of these sources of time expenditures. The gofaster package is my attempt to reduce the time an analysts takes to turn raw text into an analysis ready data format and relies on quanteda to minimize the run time. In my work I often get data in the form of large .csv files or SQL databases. Additionally, most of the higher level analysis of text I undertake utilizes a TermDocumentMatrix or DocumentTermMatrix as the input data. Generally, the tm package's Corpus structure is an unnecessary step in building a usable data structure that requires additional coding and run time. gofastr skips this step and uses quanteda to quickly make the DocumentTermMatrix or TermDocumentMatrix structures that are fast to code up and fast for the computer to build. By default stopwords = tm::stopwords("english"), min.char = 3, and denumber =TRUE. As the output from gofastr matrix create functions is a true tm object, weighting is done in the standard way using tm's built in weighting functions. This is done post-hoc of creation. To stem words utilize q_dtm_stem and q_tdm_stem which utilize SnowballC's stemmer under the hood. To filter out words with counts below a threshold we use filter_words. To filter out words with high/low frequency in all documents (thus low information) use filter_tf_idf. The default min uses the tf-idf's median per Grüen & Hornik's (2011) demonstration. To select only documents matching a regex use the select_documents function. This is useful for selecting only particular documents within the corpus. Of course we can chain matrix creation functions with several of the manipulation function to quickly prepare data for analysis. 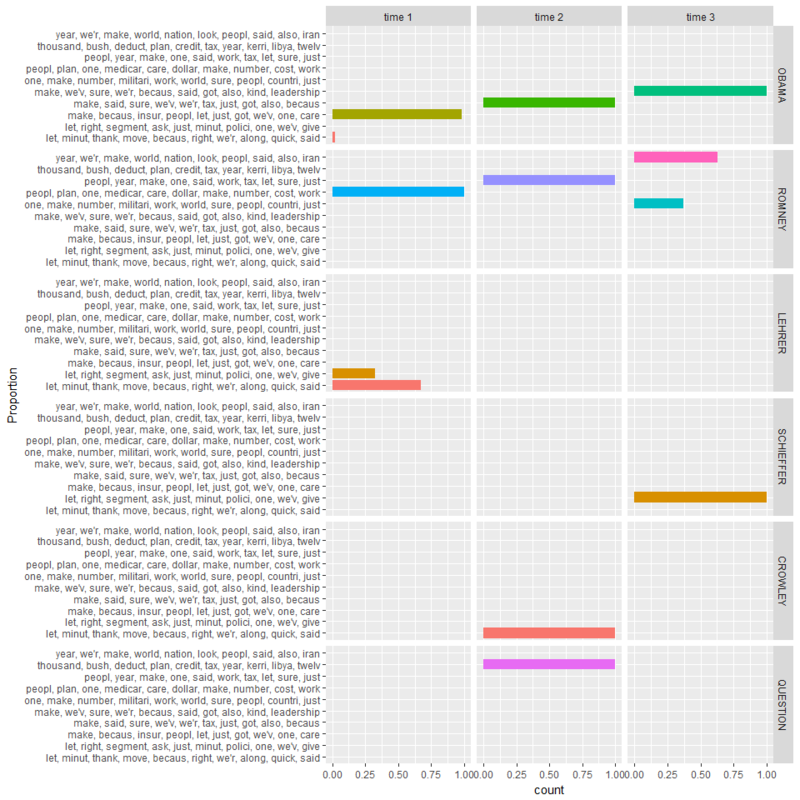 Here I demonstrate preparing data for a topic model using gofastr and then the analysis. Finally, I plot the results and use the LDAvis package to interact with the results. Note that this is meant to demonstrate the types of analysis that gofastr may be of use to; the methods and parameters/hyper-parameters are selected with little regard to analysis. The output from LDAvis is not easily embedded within an R markdown document, thus the reader will need to run the code below to interact with the results. On a smaller 2912 rows these are the time comparisons between gofastr and tm using Sys.time. Notice the gofaster runs faster (the creation of a corpus is expensive) and requires significantly less code. Changed the quanteda argument calls to reflect the changes in quanteda to use snake case rather than camel case arguments. ngrams argument added to q_dtm and q_tdm to allow ngrams in the matrix terms (see isue #3). select_document picks up an invert argument to pick documents not containing the regex match. as_dtm and as_tdm added to coerce objects to tm DocumentTermMatrix and TermDocumentMatrix data structures. This will allow other packages to easily import this function for their objects. gofastr is designed to do one thing really well...It harnesses the power of data.table and stringi to quickly generate tm DocumentTermMatrix and TermDocumentMatrix data structures.